Agile is basically a way of thinking how organizations should respond to a complex and changing world. By increasingly developing flexibility and adaptability, work in short feedback loops, providing autonomy and transparency increases learning and value creation for the customer. 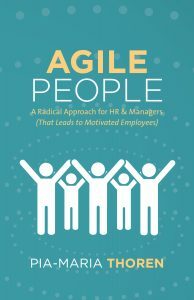 More and more organizations are now seeing the value in applying the agile mindset also in HR, both in the internal work but perhaps most importantly how an HR department helps to support an organization’s agility. When traditional processes focus on command and control, an agile HR-functions role is to create value and support unique needs. Through workshops, certification trainings (open trainings or tailored to your specific needs) and good practices and agile principles, we kan help you to implement agile HR-processes in your organization. We offer Certification in Agile HR and a Workout with practices to kick-start your agile inititiative. Learn more about our trainings and register below or contact us for customized training! Agile HR Certification Globally SWE/EN Learn more Register! Workout in Agile HR Globally SWE/EN Learn more Register!